“We said, ‘we’ll just try it and see if it works. '” And the results were 600,000 people watched it,” said Scott Moore with a smile. Earlier this year, Sportsnet tried something new: a live Twitter hockey broadcast. 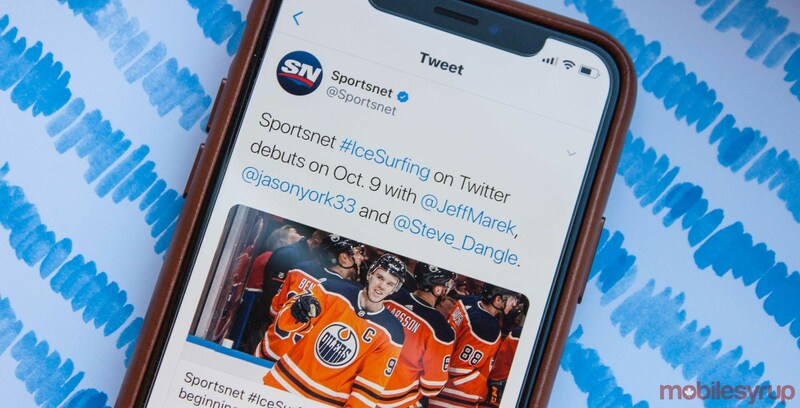 With little notice, Sportsnet’s experimental #IceSurfing show aired on Twitter in March, 2018. The live stream ran for about three hours and was a smash success. Along with 600,000 total viewers, #IceSurfing pulled in a peak of 37,000 concurrent viewers and was the most-watched domestic live stream from a Canadian media company. Moore, who is departing from his role as president of Sportsnet and NHL properties at the end of October, sat down to discuss the media company’s next big thing. #IceSurfing is a weekly live hockey broadcast on Twitter starting Tuesday, October 9th. The weekly hockey show will bounce from game to game, providing fans with analysis, highlights and on-ice action. 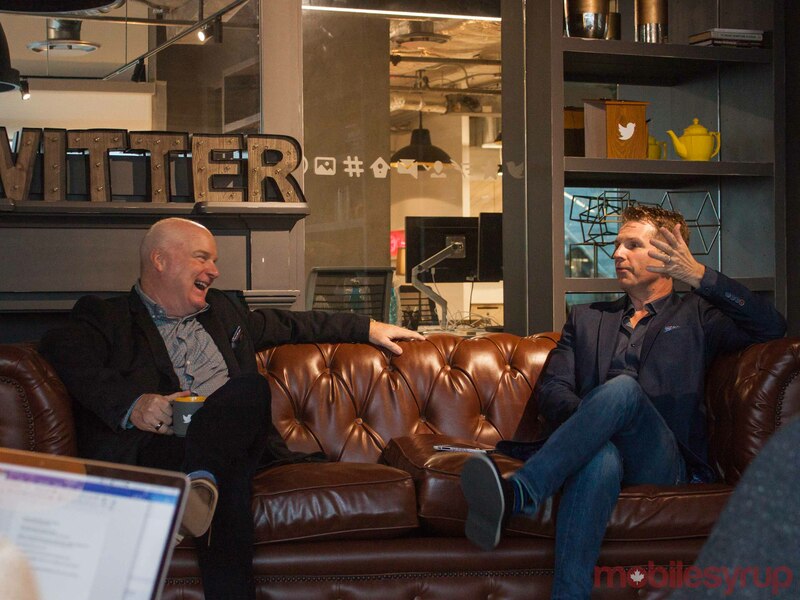 Jeff Marek, who will host the show, joined Moore on the couch at the Twitter office in Toronto. Although they weren’t present, analyst Jason York and Sportsnet blogger and hockey YouTuber Steve ‘Dangle’ Glynn will join Marek on #IceSurfing. #IceSurfing looks like a risk that’s paid off for Moore and Marek. After it’s successful early test run, Sportsnet decided to run the broadcast Tuesday nights — one of the busiest nights for hockey outside of Saturday night. With four Canadian teams across six games on this coming Tuesday, Marek and the other hosts have their work cut out for them. “I don’t know anybody now who doesn’t have Twitter open while they’re watching hockey,” said Marek. Hockey fans take to Twitter to respond to what happens in games — mini-commentaries, thoughts, opinions and analysis can all be found on the social network. The stats back it up too. Hockey is the most tweeted about sport in Canada. Furthermore, two-thirds of fans follow along on Twitter. Part of what makes #IceSurfing so compelling it that it blends the primary and secondary screen experience. However, it isn’t just a melding of experiences. #IceSurfing hopes to offer so much more. The show’s hosts, who will be accompanied by a rotating roster of special guests, can dynamically interact with the fans. That means live polls and integrating trending tweets and topics into the broadcast. It also means live feedback for the hosts and a more engaging show for the audience. According to Moore, show seventeen won’t look anything like the first show. Hockey fans watch the sport in numerous ways. Some like to watch the highlights. Others, the whole game. There’s a benefit to that — it allows viewers to dig in and experience the game, the emotion of it. But a lot of that is “empty calorie play,” according to Marek. #IceSurfing takes out the empty calories. It’s for the people who want to see the big moments and the crucial plays. It’s for the fans who want the commentary and analysis. And, it’s for the fans who want to see multiple games. Thanks to a 2013 deal that Moore worked, along with former Rogers chief executive Nadir Mohamed and former Rogers Media president Kieth Pelley, Sportsnet has the national broadcast rights for the NHL. Because of that, #IceSurfing can tap into the entire NHL universe. There are still a few things the #IceSurfing team has to figure out. For one, it’s in a bit of a new space. Because it isn’t on television, it isn’t beholden to broadcast rules like other Sportsnet shows. While that opens up more opportunities for what #IceSurfing can do, it also means the showrunners will have to take care with the content they provide. It also means things like sponsorships and advertising can — and will — look completely different. Instead of ad breaks running two minutes or more, viewers could see 30-second ad spots from a sponsor. Ad spots could be even shorter as well, and spaced out more. Alternatively, viewers may see sponsored polls, tweets and other content included in the broadcast. Furthermore, Moore said that #IceSurfing is a safe place for brands. There are trusted voices on and behind the project, so there’s no fear for advertisers. That said, there aren’t any title sponsors for the broadcast yet, though Moore feels they’ll come. Twitter’s live sports offerings have drawn big brands in the past as well. The 2018 Winter Olympics saw Visa, AirCanada and Samsung, for example. Overall, #IceSurfing is new and fluid. The show can be dynamic, adapting even midway through the stream to fit with what the audience wants. Live feedback will be integral to the success of the show. Also integral is that the content isn’t treated like a typical TV show. Instead, it needs to be treated as a ‘Twitter show.’ Moore said that if they do it like TV, #IceSurfing will fail. You can tune into the first broadcast for the 2018-19 NHL season on October 9th. #IceSurfing will air on the Sportsnet Twitter account (@Sportsnet).